A rig tune is one of the most important aspects of the integrity of your mast. I cannot stress this enough. Incorrect shroud or stay tensions can result in catastrophic failures to your mast and endanger crew members. Of course hiring a reputable rigger to do your tune is the best option, here are four areas to look at that will let you know at a glance whether or not your shroud and stay tensions are close to correct. Please keep in mind that these recommendations are in reference to the average cruising/leisure vessel with a sloop or cutter rig. The principles in general can be applied to most vessels though. Lee side tension/slack. When you are sailing in up to 15kn of breeze, there shouldn’t be much slack in your lee shrouds. Any “rattle” or movement in the turnbuckle tangs (where the shroud attaches to the chainplates) is a problem. Mast position and shape at the dock. Have a look up the back of the mast, everything should be in line, without and bends to either side. This is a very simple yet important inspection. Also stand on dock or side deck and look up the side of the mast. The masthead should be directly over the mast step, or in most cases, slightly behind the step, with a gentle bend forwards in the middle (a rig with an in-mast furler should be very straight fore and aft). There should NEVER be a bend in it that results in the middle of the mast bowing back towards the stern, and the mast head should NEVER be forwards of the step. Feel all matching shrouds (port vs starboard) to check for even tension. If there is a discrepancy between the port aft lower and stb aft lower for instance, this needs to be corrected. Mast shape whilst sailing. When out sailing on a broad reach in wind above 10kn, go and look up the back of your mast. It should be in column, without any significant bends, especially around the spreader attachment points. If it is out of column you need to make adjustments to correct this. In all honesty this isn’t as simple as it sounds and I’d recommend getting in touch with an experienced rigger to do this. Do the same up the windward side of your mast, there should be very little “pump” fore and aft as you surge through waves. This is where adequate lower shroud and fore and backstay tension are important. Interior. If you have interior doors or lockers that will not close, there is a possibility that your rig is overtensioned. Cap shrouds should be tightened to approximately 15-20% of breaking point. Going much beyond that can create weak points in the rig and risk a mast or rigging failure. Keep in mind that the interior inspection is not 100% reliable, as sometimes a correct tune will still cause misalignment inside. Thanks for taking the time to read this. 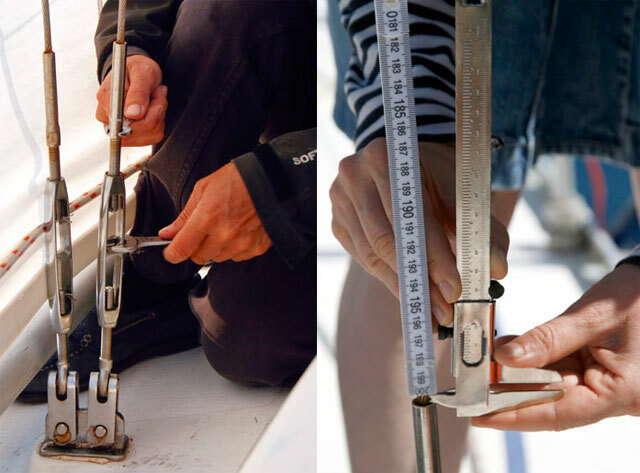 Of course rig tuning is a very tricky subject to cover in a short blog post, but this should give you a good idea as to whether or not you need to have a pro come and look at your mast and rigging. Regardless, please make sure to have a rigging inspection performed at least once every two years, preferably at the beginning of every sailing season. Please feel free to Contact Us with any questions or concerns regarding this, or leave a comment below. Previous PostTop Down furlers. What are you waiting for?